Redi2’s Wealth Manager platform was built from the ground up to solve the billing and payout challenges of the modern wealth management firm. 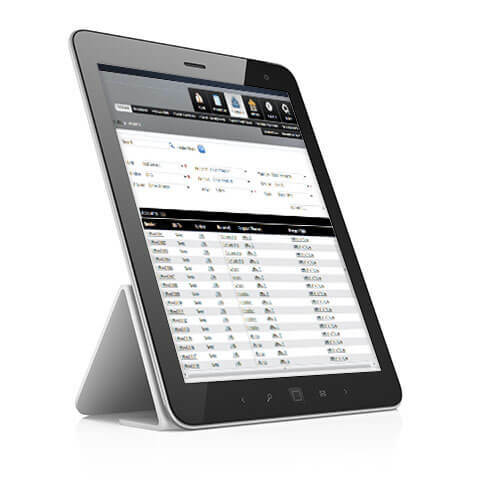 Designed with a data and workflow model that captures and understands broker-dealers, advisors, RIAs, managers, overlay managers, sponsors, service providers, custodians, TAMPS, and the UMA/SMA advisory landscape, the Redi2 Wealth Manager solution is the leading wealth management billing and revenue management platform in the industry. We believe there is truly no other solution like it in wealth management. We encourage you to see a demo! 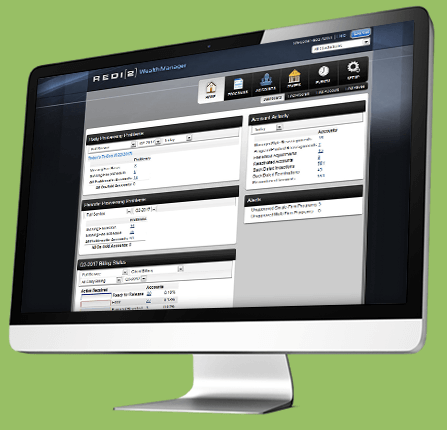 Offer your broker-dealers, advisors, and RIA firms powerful billing tools to easily and efficiently bill their clients. Firms can leverage flexible templates to quickly setup the billing of their clients across a variety of advisory programs and products, including the UMA, SMA, and RPM business models. Redi2’s Wealth Manager platform is architected to allow clients to define fees at the both account and sleeve level and at various levels of aggregation. By calculating these fees discretely, firms can provide their clients the transparency required in today’s financial regulatory environment. A powerful rules engine that supports the most custom payout scenarios your firm negotiates with your advisors, institutional clients, and third-party partnerships. All at the fingertips of billing operators and finance professionals, with secure access and controls. Let us help you automate your most intricate SMA/UMA billing and payout scenarios. Upgrade your revenue management and collection operations to a scalable platform that today calculates fees and payouts for millions of accounts at some of the most reputable wealth management firms in the industry. Handle billing processing for tens of thousands, and even hundreds of thousands, of accounts and UMA sleeves in sheer minutes with the Redi2 Wealth Manager platform. A rich, dynamic, and visual portal for your billing professionals that brings billing and payout detail to life. 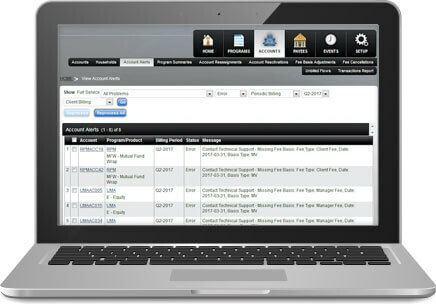 Fees, revenue, payouts, and even billing errors are shown and can be managed in easy-to-user interactive widgets. This is the cornerstone and foundation for managing your billing process. Redi2 Wealth Manager platform takes your revenue management and regulatory compliance to the next level. Gain substantial operational efficiencies and next-generation functionality with billing templates. Billing templates lets your teams define and maintain the most complex fee and payout calculations imaginable, including book-of-business aggregation and discounting. The Redi2 team will help you setup and process billing for your most complex client relationships, and do so in an automated way with flexible, reusable billing rules. Finalize and submit billing and transactional fee data to custodians and downstream platforms quickly, using both summarized and detailed views of your data within or across firms, managers, programs, and/or products. Let us help you collect your revenue faster! Deepen your understanding of your revenues, payouts, and overall billing operational efficiencies and throughput. With Redi2 Wealth Manager’s reporting and analytics capabilities you’ll gain insights into the most important aspects of your billing and finance operations. Alternatively use our rich data exports to populate your own in-house data warehouses for an even more custom and integrated business reporting experience. Interested in learning more about Wealth Manager?